Renowned for the oldest university of India, Nalanda is located in Bihar. 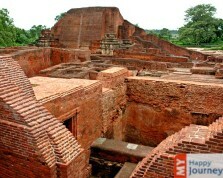 A place of knowledge, Nalanda witnesses three main seasons namely, summer, winter and monsoon. The best time to explore the beauty of this place is from October to March. November to February- It is the time when the temperature drops down to 4°C. During the daytime the temperature remains around 28°C, which makes it an ideal time to discover various monuments and sightseeing options here. It is also the time when you can enjoy nature at its best at Nalanda. March to June- Summers here are quite hot, as the temperature varies from 20°C to 44°C. The days are a bit warm; however cool evenings are considered ideal to explore this place. July to September- It is the season when this place receives sporadic rainfall. Showers, apart from bringing down the temperature, also augment the beauty of the whole area. It makes the environment more fresh and rejuvenating. Very cold, Foggy Weather remains extremely cold during the month of January, with the region also experiencing foggy conditions. Climate during daytime can be pleasing which makes it suitable for travelers to indulge in outdoor activities or sightseeing. Evenings are comparatively cooler and require extra care especially when travelling with elders or small children. Heavy woolens should be taken along to deal with cold weather. Moderately cold February experiences pleasantly cold weather, with the days accompanied by clear skies filled with plenty of sunshine. This is a good time to indulge in sightseeing or to try out different outdoor activities as the climate remains within comfortable ranges. Tourists can also enjoy themselves amidst natural vistas of the city. Vacationers generally prefer to carry light woolens as after the sunset, the city gets cold. Pleasant The amazing city of Nalanda welcomes spring in the month of March. A rise in the temperature is observed in the region; however it still remains within comfortable ranges. This is one of the best months to plan a journey to Nalanda, as the days are dominated by clear blue skies accompanied by ample sunshine. Vacationers can easily plan their trip to Nalanda to explore this magnificent region. Very hot With the days becoming warm, the month of April marks the beginning of summer season. Summers in the region are extreme with temperature soaring up to 48°C. The weather starts getting a bit too hot for comfort; therefore this is not a suitable month for tourism. If you plan to travel in the month of April, remember to wear light cotton clothes along with packing sun protective gears. Very hot May is considered as the hottest month of the year. As the temperature continues to rise, planning a holiday to this destination can be difficult during this time. The sky remains clear except from a few passing clouds. The scorching sun can hinder outdoor activities, making this month less favorable for planning a visit to Nalanda; however tourists can sill opt for different indoor activities. Very hot The weather conditions remain similar to the previous month as the city remains equally hot. Monsoon is expected to hit the region by the mid of this month; thus offering some relief from the heat. Thunderstorms accompanied by intermittent rainfall increase the humidity level making it difficult to take pleasure in tourist activities. Travelling during this month would require sun protective gears. Rainy Monsoon hit the region with the beginning of the month of July, leading to heavy downpour and increasing humidity. Rain lovers and nature enthusiasts can plan a trip around this month as the natural beauty of the city is enhanced by monsoon. Nalanda receives the highest amount of rainfall during this month; therefore when venturing out it is essential to be equipped with proper rain gear. Rainy Rain continues to drench the city, making it difficult to travel around this region. Most of the days of this month are filled with heavy rainfall, which sometimes continue for long period. Atmosphere remains cool; however increasing humidity is seen as a hindrance. This is not a preferred month for tourism however if you wish to visit the place remember to carry umbrella or rain gear. Moderately hot September has clear skies with occasional showers. The temperature lies within comfortable ranges, making it convenient for travelers to enjoy their journey to the fullest. Occasional monsoon showers stop completely by the end of this month and the fascinating natural beauty of the region is worth exploring. A trip to Nalanda during September can prove to be very enjoyable. Pleasant Nalanda witnesses a rush of visitors, as October marks the beginning of official tourist season. Around this time vacationers can enjoy sightseeing, along with indulging in exciting outdoor activities. The natural beauty of the region blossoms after monsoon, mesmerizing the tourists and vacationers. This is the most preferred time to plan a holiday to the city. So pack your bags and head toward Nalanda. Moderately cold Each passing day offers cool climate to indulge in the beauty of Nalanda. As the month of November begins winters approach the city, making it a great time to enjoy outdoor activities. With the presence of adequate amount of sunshine, weather remains within enjoyable ranges. Comfortably warm days are followed by cool evenings, which give a chance to the travelers to enjoy with their loved ones. Very cold Advent of winters is marked with the beginning of the month of December. Days are filled with beautiful sunshine while the evenings can be very cold. This is a good month for tourism and the travelers are advised to carry light woolen clothes to deal with the cold. Extra care of small children should be taken if travelling in this month.